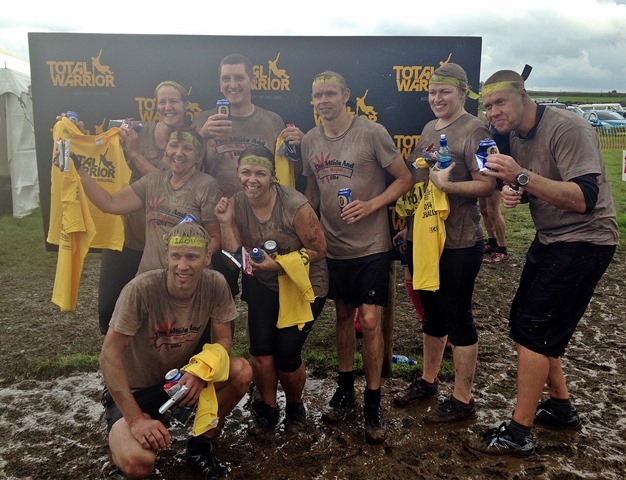 I can happily say that I completed Total Warrior 2014. I wouldn’t of been able to do it without the help of my team – it’s definitely a team work event, and I wish I had built my leg strength up some more, but I’m still very proud! It’s always been an event that I thought looked like fun, so when my mum suggested it I signed up. 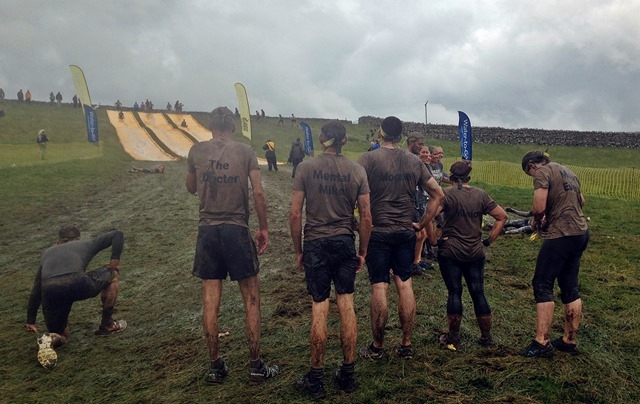 We had a mixture of a team, some were very fit, some were just fit, but our aim was to get everyone across the finish line, so we ensured everyone was given a helping hand at every obstacle. Today was an extremely wet day – the rain was ridiculous at some points, which made the course very slippery and very muddy! I’ve never seen mud like it! 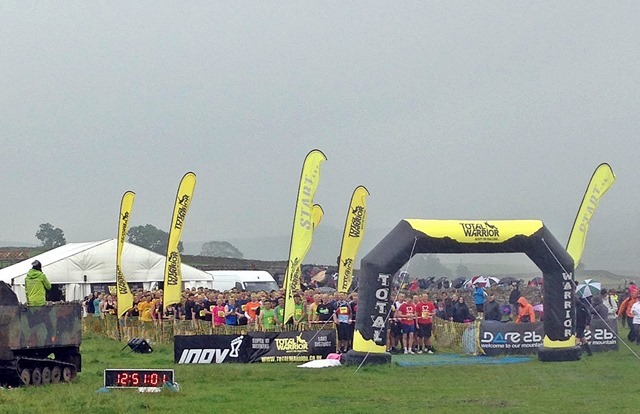 After arriving at a very wet Shap, we handed in our waiver forms, put on our headbands and numbers and headed for the start line. 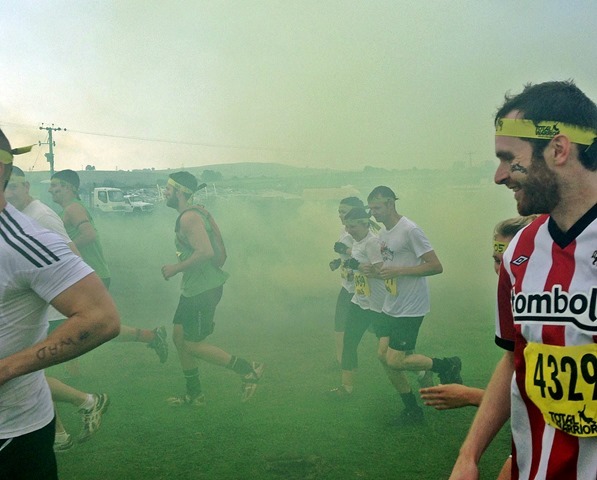 After a short warm up and a big motivational speech – all very braveheart! We headed on our way onto the fells and away from spectators, so I don’t have any photos of me jumping over flames, climbing on a 7 foot wall then falling off and onto my head (not recommended! 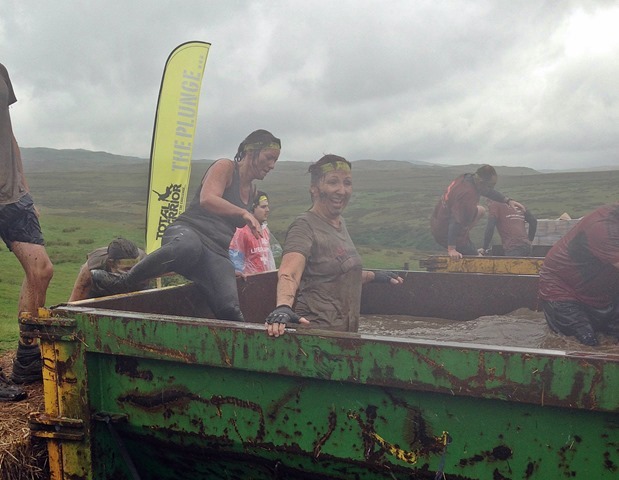 ), crawling through very deep mud, waded through even more mud, swimming across cold rivers and so much more! After about 7km of the 10km race we arrived back to an area where spectators could watch. By this time I think our legs were all very tired. I’ve never had such heavy legs, and know for next year to focus on strengthening them up. I spent a lot of time working on my upper body, which helped, but I underestimated how tough running on the terrain and wading through waist deep mud would be. Back to the photos – Unfortunately (or fortunately) the ice dip wasn’t filled with ice and was just a skip of very cold water. 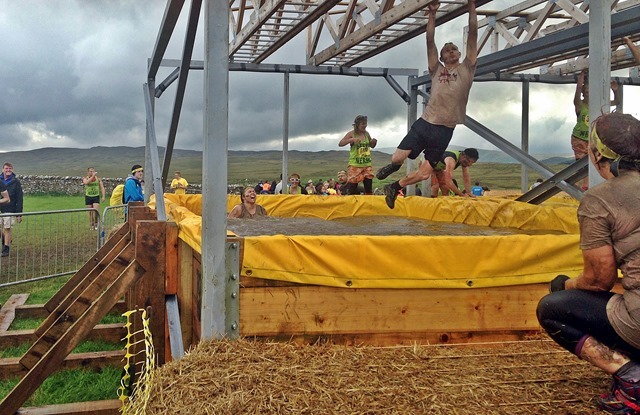 I skipped the electrocution – but was shown up by many others who went through it. 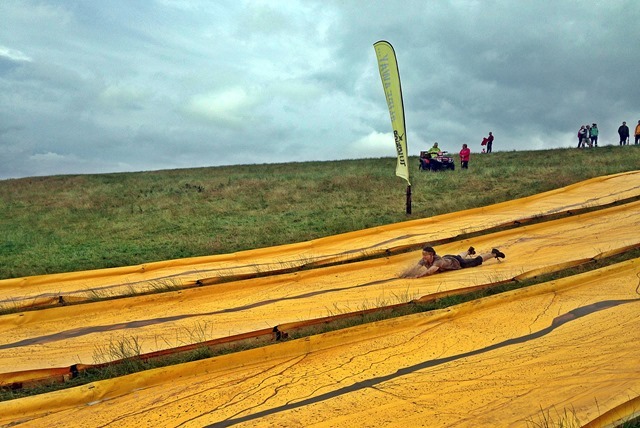 Next came the slide which was a lot of fun – a nice change to some of the tougher obstacles! 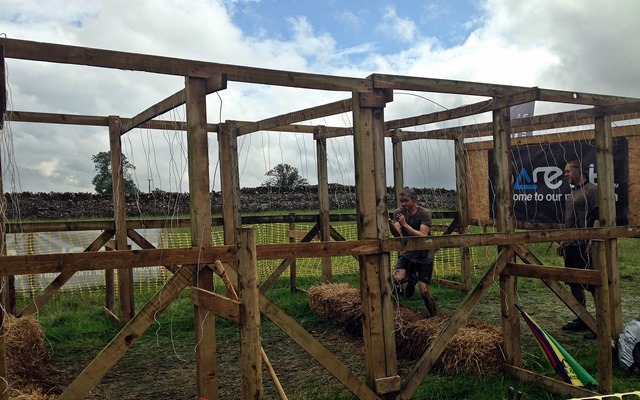 Next came my toughest obstacle – the 15ft wall at a 35 degree angle with only a 4ft rope! After watching many try, slip and fall, and after falling off a 7ft wall I was pretty apprehensive for this one. However my team bunked me up so I could make a good jump for the rope. I grabbed the rope and slowly made my way up the wall, however only a couple of feet from the top I slipped and was left gripping to the rope (for what seemed like my life!) I definitely didn’t want to fall 13 feet back down! I managed to pull myself up the rope with some struggle and was thankfully helped by my mum and a man at the top who grabbed my arms. It took me a while ( I may of panicked slightly) but I managed to get over the top! I’m definitely glad I worked on my upper body strength as there is no way I would of done it without it! 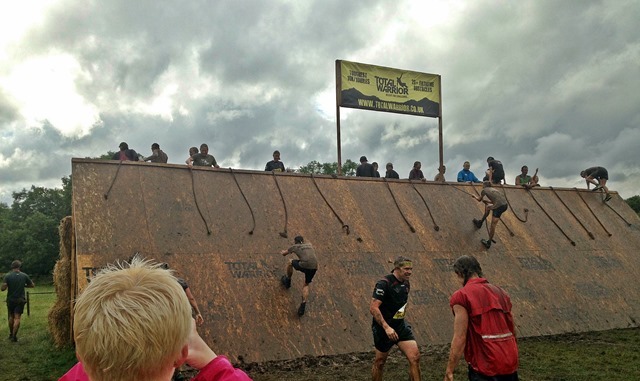 It seemed like quite a few people were slipping at the same point on the wall – so at least I wasn’t the only one! 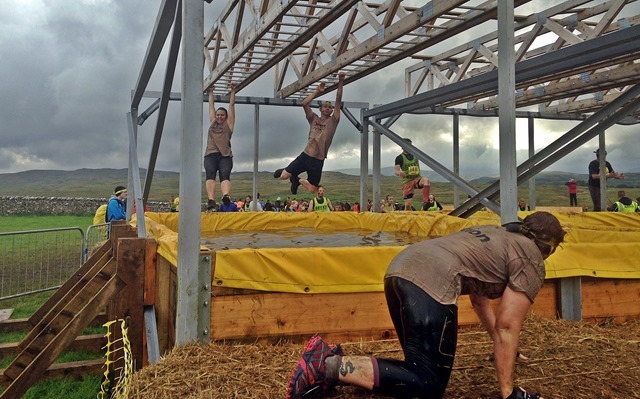 The last obstacle was monkey bars – which was very cruel of the organisers seems everyone is tired, wet and muddy. However we all gave it a go. I don’t think any of the girls in the team got all the way across, but it does make for some very funny photos (like the above) when we did fall in! Over all I had a fantastic day. We’re already planning next years! We may of not of achieved the best time – but our aim was to finish the whole race as a team, and every single one of us crossed the finish line at the same time – never leave a man behind! We now know we can do it, and know how the race is, so we’re planning on getting a good time on the next one! I’m now very tired, covered in bruises and scratches and have a very bad head from my fall, but I still proud of finishing! 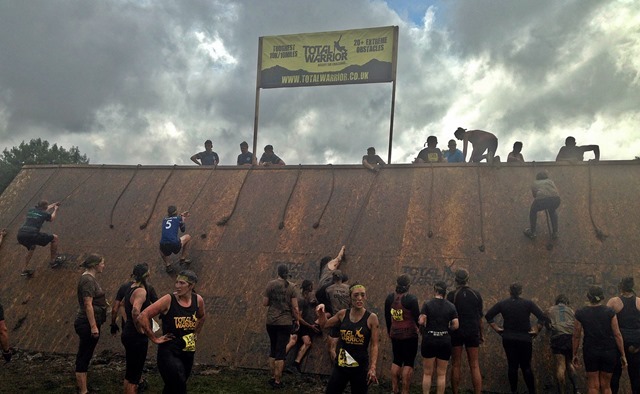 Did you take part in Total Warrior this year? How did you find it? 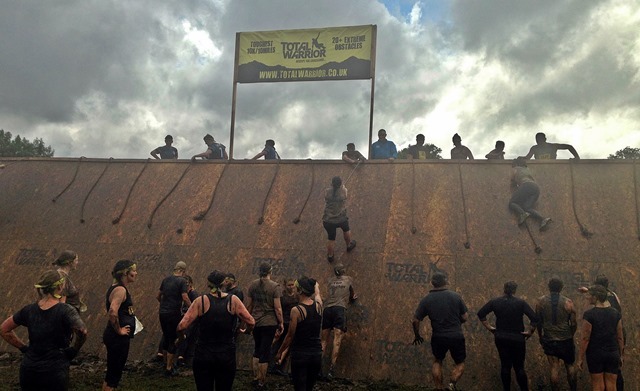 Have you ever tried any races similar to Total Warrior – or would you like to? Go you! That sounds horrific! 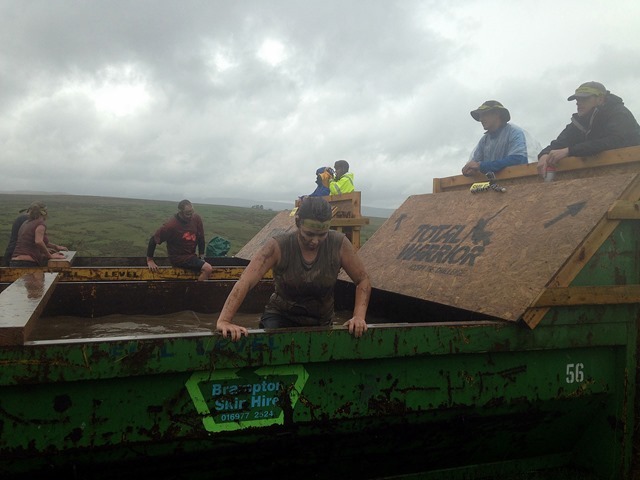 It was tough but alot of fun… can’t wait to do it again! Congratulations on finishing the race as a team. It looks tiring but I can see that you were all definitely having a great time. I would love doing something this if given the chance. Not only does it help in making you healthy, it also strengthens the bond of friendship. It was alot of fun and great to work as a team!